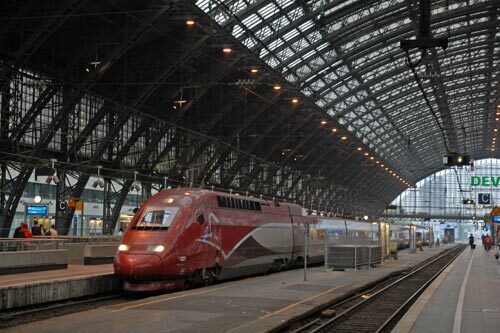 The journey from Brussels to Cologne has benefited from the construction of high speed track and the introduction of new rail services with both Deutsche Bahn and Thalys providing regular services. The main station in Brussels - Gare du Midi or Zuid depending on the language - is not that inspiring in terms of architectural design. However what the station lacks in style is more than compensated by the functional efficiency. The high speed services start from the west side of the station which has seen some modernisation as new trains have entered service. This journey on board the 1728hrs service from Brussels was operated by unit no. 4321 which had started from Paris Nord at 1601 hrs. Travelling first class my first impressions were good with striking red and black décor and an at seat service of complimentary drinks and snacks. 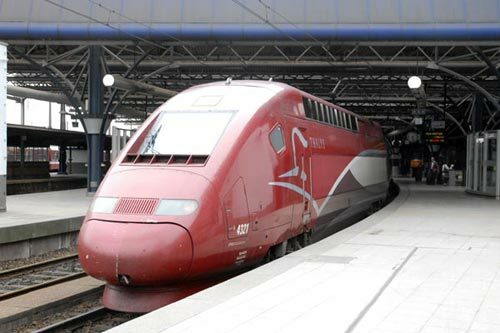 With a delayed departure from Brussels due to someone falling ill and requiring medical attention, the train lost its path through the busy tunnels under Brussels and progress was very slow until the newly constructed high speed line (HSL2) was joined east of Leuven. Rapid progress was then made through the countryside towards Liege. Glimpses of the once extensive coal mining industry are seen as the land becomes less flat. Ahead storm clouds had turned a pleasant evening into night as we slowed and left the high speed line for the first station stop at Liege-Guillemins station. The approach to the station passes through streets full of terraced houses and it is hard not to compare the scene with similar mining areas in Britain. The 'two- up- two- down' terraced house appears to be just as popular in Belgium as at home in the UK. Liege station is one of the great modern stations in Europe. The platforms are covered by a huge concrete structure that appears to me to mimic an upturned basked made from concrete and glass. The effect is amazing and I only wish I had time to stay awhile and admire the station. Sadly modern travel is time constrained and the inevitable whistle from the platform heralded departure for Aachen and Cologne. Joining the next section of high speed line (HSL3) the train ran a full speed through to the German border passing through some attractive hilly country with frequent tunnels avoiding the need to slow for curves. Today the border is unmarked and the only clue to arrival in Germany is the car number plates have changed. Now on Deutsche Bahn territory the trains are most red and there is an air of Germanic efficiency about the whole operation. The stop at Aachen was brief and we were soon on our way again. To the left there was evidence of extensive civil engineering works but in the thundery gloom it was hard to make out too much detail of what was going on. Was I dreaming or was it a new railway line? The approach to big cities is usually marked by extensive railway yards and sidings. The approach to Cologne is no different and a cautious approach to the platforms under the great arch of Cologne Hauptbahnhof signalled the end of this interesting journey. Leaving the station you cannot fail to be impressed by the massive bulk of Cologne Cathedral which faces the exit across a large square. Perhaps the Cathedral goes some way to redressing the lack of architectural merit at the start of this journey.